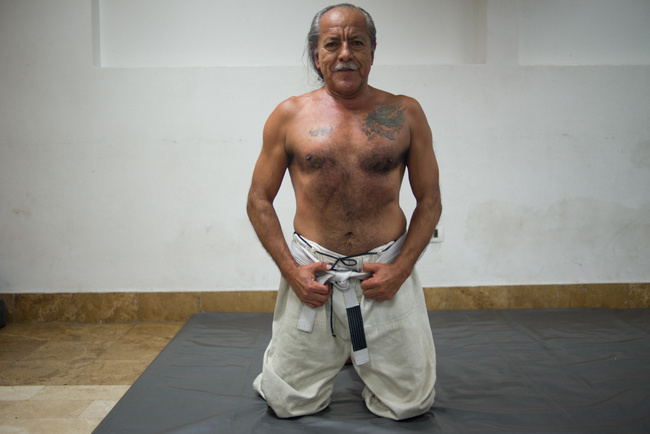 Cesar Colón is a 66-year-old white belt, training BJJ in Lima, Peru. While the age statistic is not uncommon in the world of Brazilian Jiu Jitsu, perhaps what is surprising is that he has held his beginner’s rank for nearly five years, and has chosen to stay there by choice. It is worth mentioning first that unlike other combat sports like boxing or Muay-Thai, starting later in life is a common occurrence in jiu jitsu, and many continue practicing well into old age. It’s been said that Grandmaster Helio Gracie stopped rolling only a few weeks shy of his passing at age 93, and I remember once rolling with a 55-year old who started only a half-decade earlier and thinking, “This guy should not be this strong for his age.” But someone freely refusing to advance in the belt system is more of an oddity; in fact, I’ve never heard of that ever happening in the sport. I first meet Colón at a local tattoo parlor in downtown Lima and we begin talking after I notice some jiu jitsu videos playing on his computer screen. At first I take him for a casual fight fan, but tells me he’s studying the technique to enhance his training. I find a general interest meeting fellow fighters while on the road, so I ask him about his story. Colón is of average height with a solid upper-body and sports a gray ponytail with a mustache matching the same color. By the way he carries himself and my own habit of watching too many stereotypical Kung-Fu movies, I take him for at least donning a minor-degree black belt with plenty knowledge and experience underneath it. He catches me off guard when he tells me he’s a merely white belt, and then sent me into complete confusion when he told me he first stepped onto the mat back in 2008. At this point I’m hooked to his story due to both his age and the unknown circumstance of his current belt, but I decide to tackle the matter of age first. While it isn’t uncommon to have older competitors in the sport (as belts take years to acquire), you will still find more youth frequenting the dojo, and the ones who are older have a hearty amount of experience to match their years. Not too many dare to step onto the mat later in their lives. The reason is the same reason you find less elderly beginners in any high-intensity contact sport: the fear of being injured and doubts of recuperation make the feat of beginning old seem as an impossibility, especially since jiu jitsu appears to be a sport particularly rough on the body from the outset. Make no mistake about it, in many ways it is indeed just that, but at the same time there does also appear to be aspects of bodily rejuvenation to the whole thing. I’ve always found many of the practiced positions similar to ones you’d find in yoga (only you’re simultaneously fighting someone), so perhaps the restorative elements found in the ancient ritual transfer over to allow people to endure BJJ’s physical demands well into old age. In Colón’s case, he not only found ease in adjusting his body to a jiu jitsu practice, but also an apparent dominance in it as well. “I had some doubts when I started because I saw that everyone entering was really young, some of them really heavy, or with really good techniques, but after the first session, the professor asked me how I felt. I said I felt good, so he told me to come back the next day to train again, and I did,” explains Colón with a seemingly simple logic. “I didn’t feel old with my kimono; in fact, I felt discriminated on the tatami. Everyone wanted to roll with me, but I beat all of them,” he later laughs. The mystery of the martial art is embedded into this phenomenon. It’s obvious that older practitioners won’t be able to best their 20-year old counterparts competing on strength, speed and endurance alone, yet nobody is surprised when they see age beat out youth on the mat, even if it’s of the same rank. The difference lies in things like timing, breathing, and intelligence – things that are reflective of an applied wisdom acquired through experience – and this equation reinforces the principle of technique overcoming force, a key tenant reflective of Grandmaster Helío Gracie’s original philosophy towards life. The spectrum of ages also provides a more level landscape of interaction where the young and old meet not as coach and fighter (as it is in other fighting sports), but as students learning and competing at an even pace. For Colón, he’s found little discomfort in training alongside students a third of his age and has adapted adequately from the accumulated life lessons he’s acquired in his extra years. Colón trains at one of the local stadiums in town. A number of sports are in full swing when I walk in, from field soccer to pro-wrestling. After some inquiry, I am then directed into a small room filled with about 30 people, about half of them spread out on a tatami mat, the other half doing stand-up drills with punch-mitts and boxing gloves. The room is directed by Diego Akita, a Muay-Thai kickboxing champion, BJJ brown belt and a self-proclaimed Kung-Fu master. He hands me his business card for good measure. I watch Akita running in between training spaces, correcting kick forms and choke holds, and in the center of the mat sits Colón, dressed in white gi-pants and no top. It’s apparent that the other students hold him with an awe of respect and the color of his belt didn’t seem to hold any relevancy. Colón’s trainer Diego Akita correcting positions while sparring. Colón’s choice of remaining in the beginner’s rank appears to be that of humility and of seemingly noble intentions. After all, martial arts are meant to break down the barriers of difference and heighten our perception of viewing everyone as an equal, and what better way to do that than to perpetually humble oneself as a beginner? At the same time, I look at Colón’s choice with a few mixed-emotions. There is some safety in staying in white belt. You’re given, in some ways, a “pass” in performing at a less-than-optimal capacity, and it almost becomes a shell where you can shrug off and attribute any poor performance to your belt color. I remember feeling a great deal of fear in receiving my own blue belt, as I was now expected to know something, I had fewer excuses to rely on, and the higher-belts noticeably ceased to take it “easy” on me. There is also the issue of transparency, where someone who goes up against a white belt that has the knowledge and abilities of a blue feels slighted at the disparity in skill and appearance. I bring up the issue up to Colón, asking if he faces any resentment from his teammates for holding the beginner’s rank when his experience clearly speaks of the contrary. What Colón speaks of is true. It has happened more than a few times for some BJJ dojos to hold back their white belts so they can medal more frequently at competitions and add to their gym’s legitimacy – a practice that is largely frowned upon. The one time Colón competed however, he entered with a handicap and left with two. Having an injured leg caused him to rely too much on his upper-body, which resulted in a damaged right hand. Healthy hands are the trade tools for a tattooist and having his primary income reliant on the art, he couldn’t take the risk of competing for medals. Instead, Colón’s goal is completely focused on his health and avoiding the debilitating state of peers in his age group. It has often been said that in reality, fighters are never truly fighting against actual competitors, and instead are in constant battle with their own selves where the only betterment that matters is if they showed up better than the day before. One could view defending against a submission in sparring as a metaphorical delay of mortality, that the longer ones holds out on succumbing, the more time they are able to regroup, survive, and maybe even win the fight. In this sense, jiu jitsu teaches the tools that give an extended lease on life, and merely showing up and hanging in gives birth to a renewed belief in one’s abilities. For someone like Colón, that fight against mortality is much more literal, that resurrection of belief much more crucial, and at least for the moment, he’s winning that battle in noble fashion. Colón posing with his trainer Diego Akita. According to Colón, he plans to keep up his practice for as long as he can, and informed me that he’s been granted permission from instructors that he remain at his current rank. Since he holds no plans for competitions, he contends the choice as reasonable, and is no consequence to offending tradition. The final bell rings at the stadium and Colón leads the group of students in a final stretching session for the cool-down. Akita appears next me, arms crossed, watching the closing minutes of yet another successful training day. I looked at Akita with a bit of confusion and relay Colón’s previous comment to me about his instructors agreeing to forego any advancement on his belt graduations. “It’s obligatory to graduate to blue belt no matter what he feels. He has to evolve,” Akita says laughing as he walks away. I’m not sure what happened since I interviewed these two, but I’m sure that the next graduation ceremony was an interesting one.